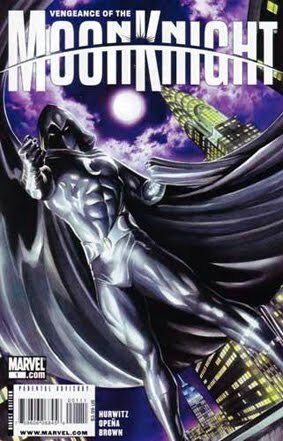 • PLOT SUMMARY: Shock and Awe: Part 1 - Moon Knight is back in the Big Apple and looking to pick a fight with the man who chased him out of town in the first place: Norman Osborn. Freed of his demons and armed with an arsenal of incredible new weapons, Moon Knight is finally the hero he always aspired to be - taking out criminals with massive flair and throwing down the gauntlet to his old nemesis. Is Osborn ready for Round Two? Plus, this issue includes a reprint of Moon Knight (1980 1st Series) #1 by Doug Moench & Bill Sienkiewicz. Written by Gregg Hurwitz. Art by by Jerome Opena. Cover by ALEX ROSS.